Roberta and Mike were married in a whirlwind of a wedding, which was unexpected given their three-year engagement. The two lovebirds kept putting off their wedding as they welcomed two little boys into the world, but couldn’t put it off much longer as Roberta’s father was diagnosed with an advanced stage of cancer. In a stroke of pure luck, Roberta stumbled upon the Azazie Tracy as an economical, timely, and high-quality alternative to the wedding dress she was originally planning on purchasing. 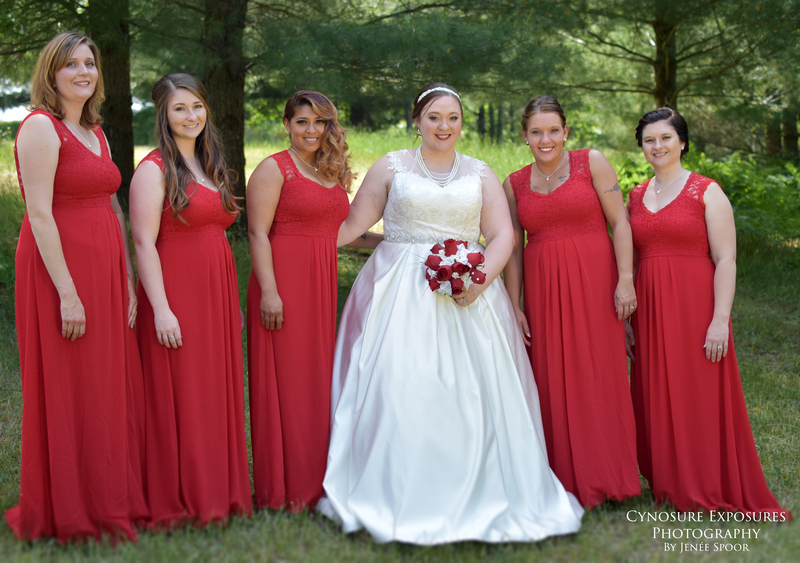 With Roberta’s skills as an event planner put to work, they were able to still have the fairytale wedding they had hoped for. All photos courtesy of Jenée of Cynosure Exposures. 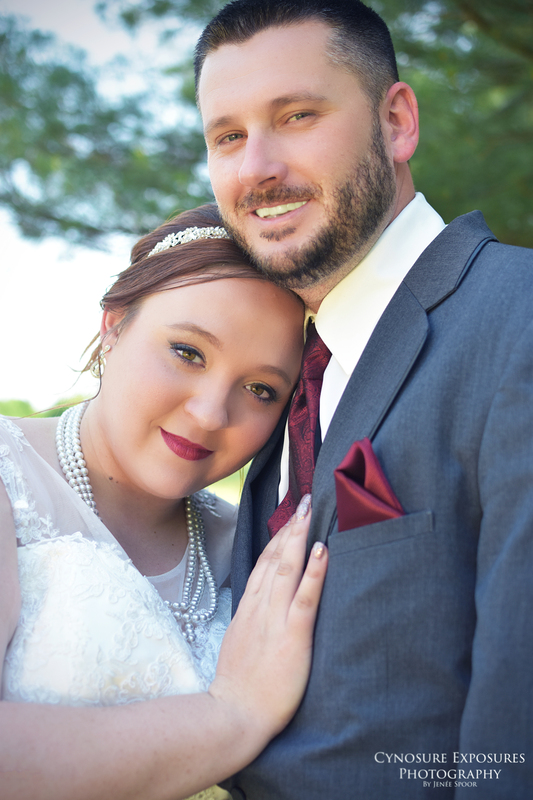 My husband and I were married and had our reception at my church. We put up a large 40×80 tent with the help of our family members and friends for the reception. 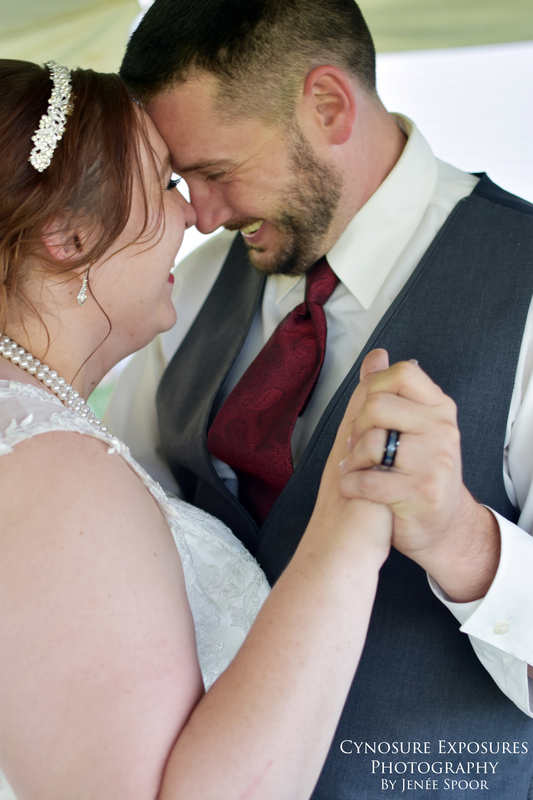 Our wedding (though we were engaged for three years) was planned kind of spur of the moment so our budget was a lot less that what we would have had given a year or more of actually planning. We were able to get the space for cheap since we are members and it has a BEAUTIFUL view of the back field. Well, my husband really wanted crimson as one of our colors. When we initially started planning our wedding we were going to have an October wedding and I thought that’s great crimson goes with a lot of other fall colors. Fast forward to our planning a June wedding in 3 months I decided to go with a Beauty and the Beast type theme. It’s my favorite Disney movie…and I always wanted to be Belle as a little girl. I went with Crimson Red, Gold, Ivory and a splash of Blushing Pink. So, so many but if I can only choose one, my father-daughter dance. My dad was diagnosed with Stage III gastric esophageal cancer last August. He’s had two rounds of chemo and an esophagectomy in January to remove the tumor. 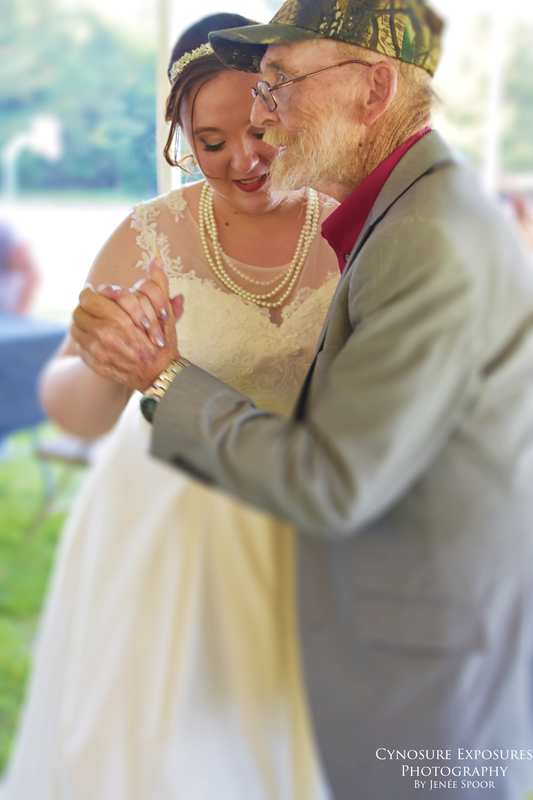 I’ve always been a Daddy’s girl and the thought of my dad not walking me down the aisle or having my father-daughter dance broke my heart. That’s why my husband and I planned our wedding in 3 months. I didn’t know what a year from now looked like. I needed that moment with my dad and having it will be one of my greatest and most cherished memories. I actually chose Azazie for my wedding dress. I had had one picked out and the deposit put down for our wedding we were going to have next fall but when we moved it up it just wasn’t in the budget any longer. I wanted something with a full skirt, long train, lace bodice, something elegant and beautiful but it had to have pockets like the dress I originally picked (I have kids, I needed space for binkies and toys, etc.). I looked everywhere for something similar but couldn’t find anything in my restricted budget that was quality-made. When I saw reviews for Azazie bridesmaids dresses I went to your site and looked at your wedding dresses. I found the Tracy and fell in love. I hoped and prayed that the reviews for the bridesmaids dresses and their quality would transfer over for wedding dresses. 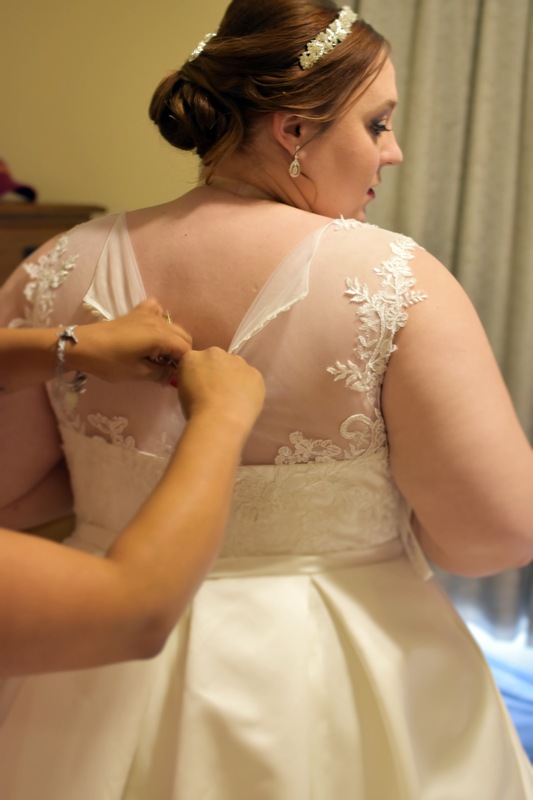 I got the dress sooner than expected and my hopes were filled as my dress was beautifully made and fit perfectly. Definitely, research and research some more. 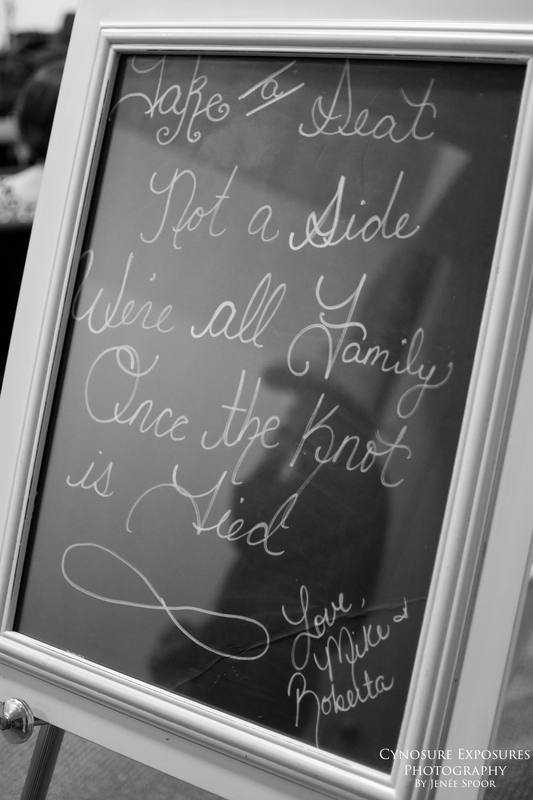 You can find GREAT deals on items you want for your wedding by researching and price comparing. Also don’t be afraid to DIY items. Most of my wedding items are DIY and I kept receiving compliments and questions on where I got my items. Last, don’t be afraid to buy your dress online -just make sure you research! Read reviews, ask questions, get measurements, and find something that will fit your body type before you order and you will be pleasantly surprised. I love planning weddings. I’m actually an event planner by trade and weddings are my favorite thing to do. Creating a dream and making it real is so fantastic. I get a lot of satisfaction from it. Since it was my own, it was even better. I am on a Facebook group for brides in my area and past brides recommended Azazie for their bridesmaids dresses out of curiosity I looked and saw the wedding dresses. It definitely goes down in the books for a fairytale moment.